Business at fertility clinics is down an estimated 25-50 percent compared to 2008 because Greeks feel they can't afford to raise children, or more than one child. About five percent of births are estimated to be in vitro, though accurate industry figures do not exist. 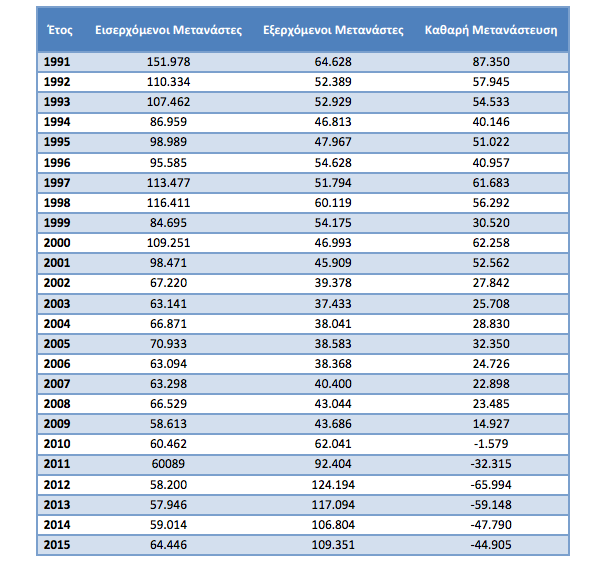 The fact that Greeks are turning away from in vitro fertilisation in addition to the fact that live births of naturally conceived babies are declining, shows that the decline is due to economic reasons. Births in 2015 numbered just under 92,000 compared to 118,000 in 2008, a drop of one fifth. Over the same period, deaths soared by 12 percent, from 108,000 to 121,000, meaning that on the basis of reproduction alone, Greek society is shrinking at a rate of about 30,000 people a year. However, there is further shrinkage due to emigration. About 45,000 more people left the country in 2015 than took residence in it. Emigration rates have accelerated since the onset of austerity in 2010 (see table below). Since then, assuming 2015 trends continued in 2016, an estimated 700,000 people have left while 400,000 have taken up residence. Immigration and emigration since the fall of the Iron Curtain. Taken together, reproductive and migratory trends mean Greece is shrinking by about 75,000 people a year, or 0.69 percent. The economic crisis is no longer an existential concern just for individual families, but for the nation as a whole, and needs urgently to be addressed with growth-promoting policies and pro-child policies. Read more on the government's current impasse with creditors.